Nigel Farage and Carwyn Jones will take part in a head-to-head debate on the UK's membership of the EU. 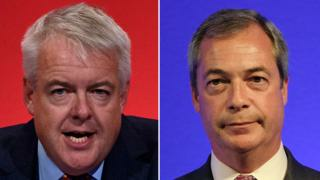 The UKIP leader and Welsh first minister will lock horns on 11 January at an event in Cardiff. On Monday. Mr Jones launched Welsh Labour's campaign for the UK to stay in the EU ahead of a promised referendum. Mr Farage said he was "delighted" by the opportunity, while a spokesman for Mr Jones said he was "more than happy" to take on the UKIP leader. In spring 2014 Mr Farage held two debates with the then deputy prime minister Nick Clegg in the run-up to the European Parliament elections, in which UKIP topped the poll. Prime Minister David Cameron is trying to negotiate reforms to the UK's membership of the EU and has promised to hold a referendum by the end of 2017 on whether to stay in the union or leave it. However, a committee of MPs said on Tuesday they believed he could not secure the reforms he wants without treaty changes - and he would not get them before before a referendum. Launching Welsh Labour's pro-EU campaign on Monday, Mr Jones said a UK exit would be disastrous for jobs in Wales, and claimed farming would "effectively come to an end" with the loss of EU subsidies. However, Welsh Secretary Stephen Crabb accused Labour of making "wild, outlandish claims" about the threat to jobs, stressing the UK government would take a "pragmatic" approach over EU membership. The debate between Mr Farage and Mr Jones is being organised by the Institute of Welsh Affairs (IWA) think tank. Mr Farage said: "I'm delighted that First Minister Carwyn Jones has agreed to debate me over the UK's membership of the EU, giving the people of Wales the opportunity to really connect with the arguments ahead of the most significant referendum in British history." A spokesman for Mr Jones said: "Carwyn is more than happy to take on the opposition. "As far as the British media is concerned, Farage is the opposition. "We have always been a very passionately pro-European government and party in Wales." When Nigel Farage and Nick Clegg traded blows in their head-to-head debates on Europe last year, they were at times bad-tempered and personal. That could easily happen next month. Both are combative. Leanne Wood is credited with landing a blow or two on Nigel Farage in the general election leaders' debate, Carwyn Jones will be looking to do the same. But it won't be easy. Unlike the leaders' debate, this will be exclusively on Nigel Farage's favourite territory: membership of the EU. We don't know when the EU referendum will be held, but we know exactly when the assembly election will take place and as a result the first minister is taking the bigger gamble if he comes out second best. On that same argument, you could also say he's got more to gain as well from a strong performance, that he can build on in the assembly campaign.